“Beneath the Mask” Mailing List subscribers receive production updates via email, as well as release information and special offers. Sign up now to start receiving the BTM newsletter. To subscribe, enter your email address in the box below, and click "SIGN UP". Your email address will be kept confidential and used only for subscription to the BTM Mailing List. Documentary filmmaker, Stephen Larnell, travels to Dillan, Nebraska to investigate the spreading phenomenon of night school ninja classes. Stephen documents the experiences of Mark Rotane, a native Dillanite who is about to enroll in a 6 week ninja course at the local Ninco dojo. Beneath the Mask: Portrait of an American Ninja tells Mark's story, and explores the passions, dreams and struggles we all encounter in modern society. Stephen Larnell’s passion for documentary filmmaking began at an early age. Growing up, Stephen spent a lot of time on the set of a news station where his dad held the position of local meteorologist. His fascination with the cameras, lights and special interest stories the anchors put together combined into a strong desire for creating documentary films. Although he hasn't had any formal training, and is only doing film work part time, Larnell has studied masters such as Bob Connolly, Albert Maysles and Genya Tachibana for years. He aspires one day to quit his day job, and pursue his true love of filmmaking full time. Larnell shot his first documentary film, entitled “Minimum Wage”, when he was eighteen. This first effort, which aired on PBS, was a challenging exploration into working conditions and wage discrepancies for immigrant workers in Helena, Arkansas. “Minimum Wage” solidified Larnell's thirst for the documentary genre and inspired him to go further. A powerful triumvirate of thought-provoking and challenging documentaries followed: “More Than Meets The Eye, a look at the plight of mono-ocular individuals”; “True Genius, a year in the life of the Eckerd Valley Middle School Academic Team”; and “Another Man’s Treasure”, a thrilling expose uncovering the flea market culture -- all of which aired on local public access cable television. “Beneath the Mask”, Larnell’s 5th film (being produced by the independent film studio: Cubit Productions), sees the filmmaker going back to his true passion in documentary filmmaking: capturing small town life through a small town dream. His vision has never been so fully recognized. 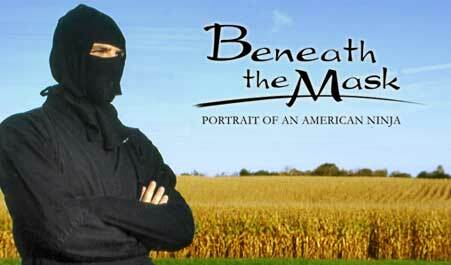 'Beneath the Mask' is a fictional documentary created by fictional documentarian, Stephen Larnell in the fictional small town of Dillan, Nebraska. The real filmmakers behind BTM are Brian Reed, Ben Sledge, and Matt Wheeler. The three wrote and shot the film in and around Lexington, KY.
Mark Rotane, a native of Dillan, Nebraska has agreed to allow Stephen Larnell to document a 6-week period of Mark's life during which he'll be enrolled in a night school Ninja class. Mark will be attending the local Ninco branch in Dillan, Nebraska to participate in the 6-week introductory course "Pre-Ninja". Larnell's film documents Mark's experiences over several weeks to find out more about the growing popularity of night school ninja classes. You can help spread the word about BTM by sending a web link to your friends, family & co-workers . Enter an email address in the box below, and click send to inform someone about “Beneath the Mask”! If you are a webmaster, you can help spread the word by linking to BTM using our flash banner or a text link. For more information on linking to us, CLICK HERE. “Beneath the Mask: Portrait of an American Ninja ” is produced and distributed by Cubit Productions, a subsidiary of Cubit Designs. All content Copyright© 2004, Cubit Designs.